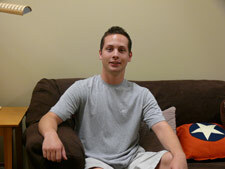 Brian Johnson is a senior in Kinesiology and a pre-med student. I've really liked my time here. To be a good physician, you need to be prepared in both the hard sciences and the applied sciences. You can be really good in biology, but when you have to focus on culture or getting someone to exercise and eat right, things that are very important for health, you can have no idea what to do. I like my hard science courses, but I really like the focus on the cultural and human aspects of health that Kinesiology offers. What has been your best/most interesting/most beneficial experience at the University of Illinois? Overall, I've really enjoyed being on a big campus that has a lot of things to do. I've been involved in student organizations, I've done volunteer work, I've had an internship. The University offers a lot of opportunities to students. I'm a member of Phi Delta Epsilon. It's the only professional pre-med fraternity on campus, and it's a really good place to network. I'm also a member of the Illinois Medical Screening Society and the Illinois Biological Society. A lot of organizations require you to volunteer, which is important for medical school. I've volunteered at Carle Hospital and really enjoyed it. You feel like you're doing something important and not just doing well in classes. I hope to enroll in the University of Illinois College of Medicine, but I would go anywhere in Illinois and be very happy. I really like the Midwest, and the medical schools here are good. I hope eventually to go in to cancer medicine, possibly cancer research. I definitely like to have fun. I'm not just a bookworm. One activity that I enjoy is Frisbee golf. It's something outside, it can be competitive but it doesn't have to be, it feels good, it feels like exercise, and it lets your mind wander away from school for a little bit.